It appears Dr. Lee was able to amass a reasonable size estate during her lifetime and manage her affairs well enough to maintain it until her death at the reported age of 95. This is certainly not an easy task for anyone to accomplish, but perhaps especially difficult for a woman of Native heritage in the late 1800s and early 1900s. I feel this speaks well of her skills as a doctor and to her character as a person. The distribution of her assets tells me she did not have any children of her own that lived to adulthood. If she had, they or their surviving children would have inherited her estate. It also suggests Isaac Henry Kanistanaux, her claimed brother, did not have any children that survived to adulthood. These conclusions are strengthen by the absence of children in any of the census households for either Lee-o-netto or Isaac Henry Kanistanaux. Carrie Horton, her claimed sister, had 3 children; Mary, Grace, and Leon Horton. Leon and Grace each received 1/3 of Dr. Lee’s estate as nephew and niece. There is no mention of Mary. This suggests Mary has died before Dr. Lee. If Mary has surviving descendants they should each get a spilt her 1/3 share. So, based on the distribution of the estate, it appears Mary was the mother of four daughters (the four unnamed grand-nieces). Without a copy of Dr. Lee’s probate records it is difficult to know why William Kanistanaux was not included in the published estate settlement. He is believed to be a grandchild of Marleah Kanistanaux, making him another presumed nephew of Dr. Lee. William should have the same right to an equal portion of Dr. Lee’s estate as Carrie’s children. He was still alive, but living in Utah at the time of Dr. Lee’s death. Perhaps that has something to do with it. I found the index to the Cattaraugus County Surrogate’s Records online. 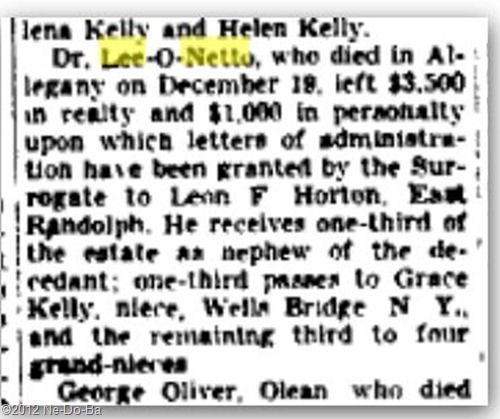 The index entry shows her given name as “Dr.” and her surname as “Lee O Netto”. It’s difficult to tell from this image, but I think there are dashes in the surname. I have very little experience using probate records, so if any of my readers notice errors in my understanding of these records please take the time to leave a comment, so we can all learn from my errors. The index record shows “Letters of Administration” filed 28-Dec-1939 naming Leon F. Horton of East Randolph, N.Y.. It also shows there was no will. In addition, the index entry shows there are documents on file under “Letters of Administration”, “Administrative Bonds”, “Minutes and Orders”, and two “Decrees of Judicial Settlements”. It shows the dates of the decrees as 30-Jul-1941 and 22-Sep-1941. I checked the LDS Catalog to see if these documents are on microfilm. Unfortunately, they are not. They will have to be retrieved the old fashion way directly from the Cattaraugus County Surrogate Records archives in New York State by a human being. These documents might provide information about the parents, heritage, and origins of this woman. At age 95, there would be no living person who would have first hand knowledge of her birth, so the information would be second or third hand at best. It was probably provided by her nephew, Leon Horton. At this point in the project, I think any source of information concerning this mysterious woman is important to gather. I am adding these documents to the priority to-do list.